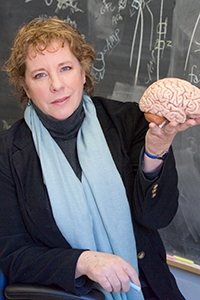 Dr. Arnsten’s research focuses on the highly evolved prefrontal cortex, elucidating the molecular mechanisms that determine the strength of network connections and cognitive abilities, with the overarching goals of understanding how genetic insults lead to symptoms of mental illness, and developing informed strategies for pharmacological treatment. Her team has identified two pharmacological agents to treat prefrontal cortical dysfunction in patients: Guanfacine, FDA-approved for Attention-Deficit Hyperactivity Disorder treatment and used off-label to treat Tourette’s syndrome, frontal lobe traumatic brain injury and behavioral symptoms in Autism Spectrum Disorders; and Prazosin, currently being tested in patients with Post-Traumatic Stress Disorder, including troops returning from Iraq and Afghanistan. Dr. Arnsten received her B.A. with Honors in Neuroscience from Brown University in 1976, and her Ph.D. in Neuroscience from the University of California, San Diego in 1981. Following her doctoral studies, Dr. Arnsten performed post-doctoral research with Dr. Susan Iversen at the University of Cambridge in England and then with Dr. Patricia Goldman-Rakic at Yale University.